Antoni Folkers is a Dutch architect who is working in Africa for almost 30 years, in the field of architecture. Graduated in 1986 as an architect and urban planner at Delft University, his engagement to African architecture started in the eighties when he was living and working as an architect in Tanzania and Uganda and has never left him ever since, now he is a resident Architect for East Africa. He has been a cofounder of various offices and foundations: in 1992 FBW Architects with offices in the UK, the Netherlands, and Uganda; in 2001 ArchiAfrika; and recently, in 2010, he cofounded African Architecture Matters. The main aim of these organizations is the promotion of African architecture and the conservation of it. The aim of ArchiAfrika, where he is the director, is to give more attention to African architecture as a whole and of course in promoting and improving African architecture through academic exchange, education, and through professional input. The target of ArchiAfrika is to put (modern) African architectural culture on the world map. He wrote the renowned book “MODERN ARCHITECTURE IN AFRICA”, one of the few studies on modern African architecture. The work raises the discussion about the place of the often moralizing and simplified period of western modernism, while also providing a wide-ranging survey of the many-sided and colorful architecture from different regions in Africa. 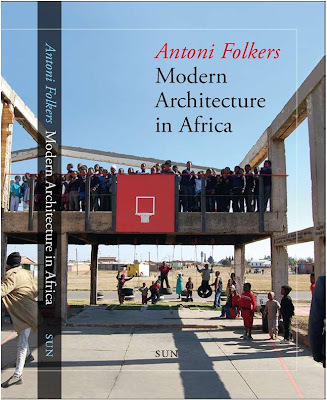 Using practical, illustrated examples, Folkers documents and describes the different hybrid architectural forms that have arisen out of a confrontation with western architecture and city planning and in so-doing tells an alternative history of African architecture.